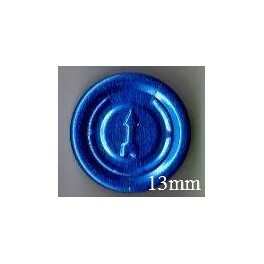 13mm Complete Tear Off Vial Seals, Sapphire Blue, Pk 100. Crimps on serum vials with a 7mm hole opening and 13mm rim to rim diameter. For use when the aluminum seal and stopper (sold separately) are to be completely removed to POUR out vial contents.